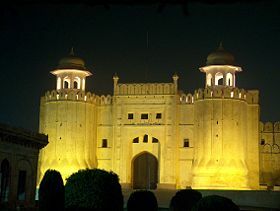 The Lahore Fort, locally referred to as Shahi Qila citadel of the city of Lahore, Punjab, Pakistan. Located in the northwestern corner of Lahore, adjacent to the Walled City, the fort hosts a number of famous sites including: Sheesh Mahal, Alamgiri Gate, Naulakha pavilion, and Moti Masjid. The fort measures 1,400 feet long and 1,115 feet wide. In 1981, UNESCO designated Fort Lahore together with Shalamar Gardens a joint World Heritage Site identified as Fort and Shalamar Gardens in Lahore. Shah Jahan made the improvements on Fort Lahore and built the Shalamar Gardens in Lahore. 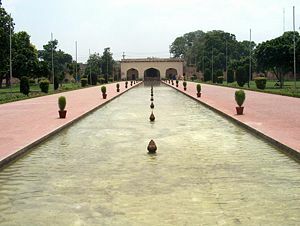 Mughal architecture graced India and Pakistan, created after the independence of India in 1947, with many architectural world level treasures, including the fort and garden in Lahore. Shah Jahan intended that the people who live in and visit his fort and grounds would have a sense of the beauty of the teaching of Islam and the Koran as well as the military might of his domain. The origin of Lahore Fort remains obscure in myths. The foundation of Lahore and its fort has been attributed to Lav, the son of Rama, the hero of the Ramayana of epic age (1200 B.C.E.-800 B.C.E.). During the excavations conducted in 1959 C.E. by the Department of Archeology, a gold coin of Mahmood of Ghazni dated A.H. 416 (1025 C.E.) had been found at a depth of 25 feet from the level of the lawns in front of Diwan-e-Aam. Cultural layers continued another 15 feet, giving strong indications that people had lived here long before the conquest of Lahore by Mahmud in 1021 C.E. Records establish the history of the Fort to Shahab-ud-din Muhammad Ghuri's successive invasions of Lahore from 1180 to 1186 C.E. The Sheesh Mahal (Urdu: شيش محل Hindi: शीश महल), literally "Crystal Palace," represents one of the most lavish rooms within the Lahore Fort. Small pieces of colored mirror cover the walls and ceiling. The Mughal Emperor Shah Jahan constructed the Sheesh Mahal in 1631. The palace of the Agra Fort, the Amber Fort of Jaipur, and the Harimandir Sahib have similar well-known rooms called "Sheesh Mahal." 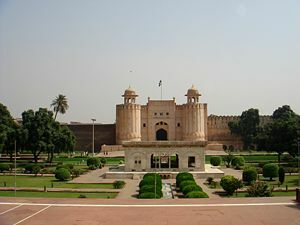 The Alamgiri Gate (عالمگيرى دروازا), built in 1673 C.E., constitutes the main entrance to Lahore Fort in present day Lahore, Pakistan. The gate had been constructed to face west towards the Badshahi Mosque in the days of the Mughal Emperor Aurangzeb. The monumental gateway, an imposing vestibule, has two semi-circular bastions flanking it with boldly fluted shafts, lotus petaled bases, and crowned with domed pavilions. The huge arched entrance in the center had been designed to allow the emperor's elephant mounted caravan to pass through. It leads to the central square hall having deep arched recesses on the east and north and a staircase leading to the upper storey buildings. The archway on the south leads to interior of the fort. The Naulakha pavilion, a marble building in the Sheesh Mahal courtyard, located at the Lahore Fort in Lahore, Pakistan. Its western face provides a panoramic view of the ancient city of Lahore. When built in 1631 C.E. by the Mughal emperor Shahjahan, it cost Rs.900,000, an exorbitant amount at the time. Called Naulakha because in Urdu, that word means "worth 9 lakhs" (one lakh equals 100,000). The Pakistani embassy in Washington D.C. has modelled on the Naulakha pavilion. The Moti Masjid (Hindi: मोटी मस्जिद, Urdu: موٹی مسجد, translation: Pearl Mosque), a gigantic mosque made of white marble built by the Mughal emperor Aurangzeb at the Red Fort complex in Delhi, India, from 1659-1660. Shahjahan, Aurangzeb's father built a mosque by the same name in 1645 C.E. inside the Lahore Fort. 1025 C.E. : Who originally constructed Lahore Fort, and when, remains uncertain. Evidence found in archaeological digs provides strong evidence of the founding happening long before 1025 C.E. 1241 C.E. : Destroyed by Mongols. 1267 C.E. : Rebuilt by Sultan Ghiyas ud din Balban. 1398 C.E. : Destroyed again, by Amir Tamir's army. 1421 C.E. : Rebuilt in mud by Sultan Mubark Shah Syed. 1432 C.E. : Shaikh Ali of Kabul occupies the fort, repairing damage inflicted Shaikha Khokhar. 1566 C.E. : Rebuilt by Mughal emperor Akbar, in solid brick masonry on its earlier foundations, expanding the grounds towards the river Ravi, which then and up to about 1849 C.E., used to flow along its fortification on the north. Akbar also built Doulat Khana-e-Khas-o-Am, the famous Jharoka-e-Darshan (Balcony for Royal Appearance), Masjidi Gate. 1631 C.E. : Shahjahan builds Shish Mahal (Mirror Palace). 1633 C.E. : Shahjahan builds Khawabgah (a dream place or sleeping area), Hamam (bath ) and Khilwat Khana (retiring room). 1645 C.E. 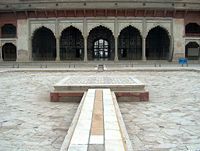 : Shahjahan builds Diwan-e-Khas (Hall of Special Audience) and probably also Moti Masjid (Pearl Mosque) in the same year. 1674 C.E. : Aurangzeb adds the massively fluted Alamgiri Gate. 1799 C.E. : The outer fortification wall on the north with the moat, the marble athdera, Havaeli Mai Jindan and Bara Dari Raja Dhiyan Singh were constructed by Ranjit Singh, Sikh ruler from 1799-1839 C.E. 1846 C.E. : Occupied by the British. 1927 C.E. : The British hand over the Fort to the Department of Archaeology after demolishing a portion of the fortification wall on the south and converting it into a stepped form thus defortifying the fort. The Mughal emperor Shah Jahan built the Shalimar Gardens (Urdu: شالیمار باغ), sometimes written Shalamar Gardens, in Lahore, modern day Pakistan. Construction, begun in 1641 C.E. (1051 A.H.), reached completion following year. Khalilullah Khan, a noble of Shah Jahan's court, in cooperation with Ali Mardan Khan and Mulla Alaul Maulk Tuni superintended the project. The Shalimar Gardens lays out in the form of an oblong parallelogram, surrounded by a high brick wall, famous for its intricate fretwork. The gardens measure 658 meters north to south and 258 meters east to west. In 1981, UNESCO included Shalimar Gardens along with the Lahore Fort, as a designated UNESCO World Heritage Site in 1972. The upper terrace named Farah Baksh (Bestower of Pleasure). The middle terrace named Faiz Baksh (Bestower of Goodness). The lower terrace named Hayat Baksh (Bestower of life). Shah Nahar Canal. Engineers brought Shah Nahar (Royal canal), later also known as Hansti canal (Laughing canal) from Rajpot (present day Madhpur in India), a distance of over 161 kilometers, to irrigate the Gardens. The canal intersected the Gardens and discharged into a large marble basin in the middle terrace. Water cascades. The Gardens have five water cascades, including the great marble cascade and Sawan Bhadoon. The site of the Shalimar Gardens originally belonged to one of the noble Zaildar family in the region, well known as Mian Family Baghbanpura. The family had been given the Royal title of "Mian" by the Mughal Emperor, for its services to the Empire. 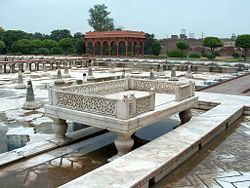 Mian Muhammad Yusuf, then the head of Mian family, donated the site of Ishaq Pura to Emperor Shah Jahan, after the royal engineers, who wished to build on the site due to its good position and soil, placed pressure on the family. In return, Shah Jahan granted the Mian family governance of the Shalimar Gardens. The Shalimar Gardens remained under the custodianship of that family for more than 350 years. In 1962, General Ayub Khan nationalized the Shalimar Gardens because top Mian family members had opposed his imposition of martial law on Pakistan. The Mela Chiraghan festival took place in the Gardens, until President Ayub Khan decreed a prohibition in 1958. Chaudhry, Nazir Ahmad. A Guide to Lahore Fort. Lahore: Sang-e-Meel Publications, 2004. ISBN 9789693516449. Dogar, Muhammad Aasim. Splendour of Lahore Fort. Lahore: Ilm Dost Publisher, 1995. OCLC 39322396. Waliullah Khan, Mohammad. Lahore and Its Important Monuments. Lahore Fort: [Dept. of Archaeology, Govt. of Pakistan], 1959. OCLC 8358467. Lahore Fort as seen from space (Google Maps). Photos from Lahore Fort by Waqas Usman. History of "Fort and Shalamar Gardens in Lahore"